One hundred goddesses took to the streets of Liverpool City Centre today ahead of a special festival put together by young women. 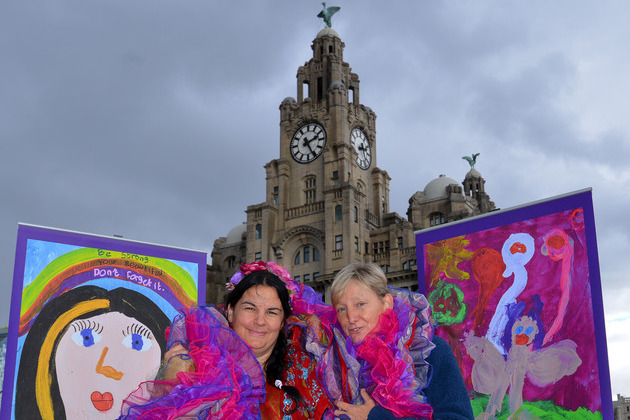 The colourful motivational paintings, produced by 8 to 23 year olds from around Knowsley, will be first shown all together at an empowering event supported by Knowsley Youth Mutual on Tuesday, October 28 at The Venue in Huyton. Creative therapist and founder Clare Campbell will be joined by chief executives and public health departments from across the region that are all backing the girls’ celebration, which showcases the importance of creating safe spaces for young women to raise their self-esteem through art, as well as teaching the girls how to sit together in circles. Clare said: “Following the success of our latest Big Love Little Sista project over the past eight weeks, the festival aims to give the girls a platform to tell their amazing life stories through the imagery of the inspirational goddesses they have created. After finding solace in art and combating her own personal struggles through the ‘healing power of creativity’, Clare has set up multiple social initiatives to celebrate and unite women. In addition to the most recent project Big Love Little Sista, other highly acclaimed projects include Big Love Sista and Wild Woman. The Big Love Little Sista festival will take place on Tuesday, October 28 at The Venue between 10am-4:30pm. Admission is free, however a suggested £5 - £20 donation is recommended.